Q. 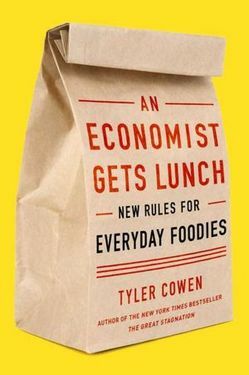 What restaurant or food type would Tyler Cowen, Murray Rothbard and Ludwig von Mises enjoy for lunch? Why? -Bill N.
A. Rothbard was quite a conservative eater, but he loved the Bavarian culture of the Baroque. Mises grew up in the Austro-Hungarian Empire. So I suggest that we would all sit down and have a Wiener Schnitzel together. You can buy An Economist Gets Lunch here. This entry was posted in An Economist Gets Lunch, Books and tagged An Economist Gets Lunch, freakonomics, Ludwig von Mises, Murray Rothbard, Wiener Schnitzel. Bookmark the permalink.